The members of Stenocereus have typically worn four or more names during their botanical history. Stenocereus is derived from the Greek word stenos “slender”; for sake of having thinner branches than a true Cereus spp. ; however, this is not true for all Stenocereus and Cereus species. “Cereus” came from the Latin cera meaning “waxy” in reference to the candle or candelabra-like shape of the Cereus species. Lemaireocereus was named after Charles Lemaire. 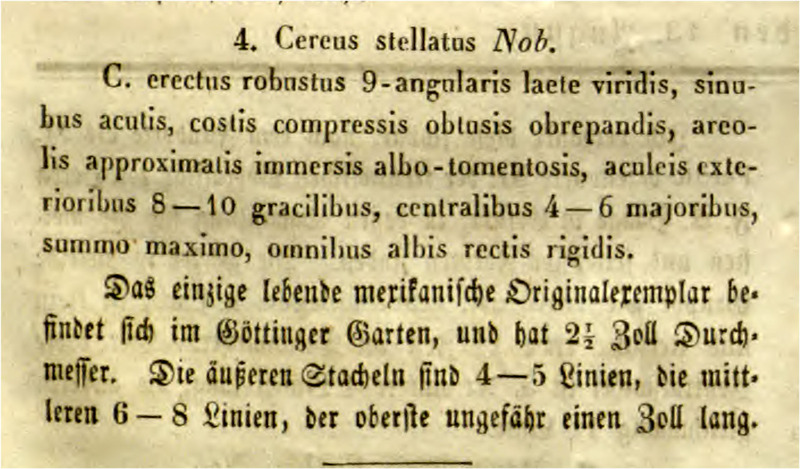 Carl Ehrenburg (1844) Botanische Zeitung, 2: 835, as Cereus beneckei. Alvin Berger & Franz Buxbaum (1961) Botanische Studien, 12 (Entwickl. Trib. 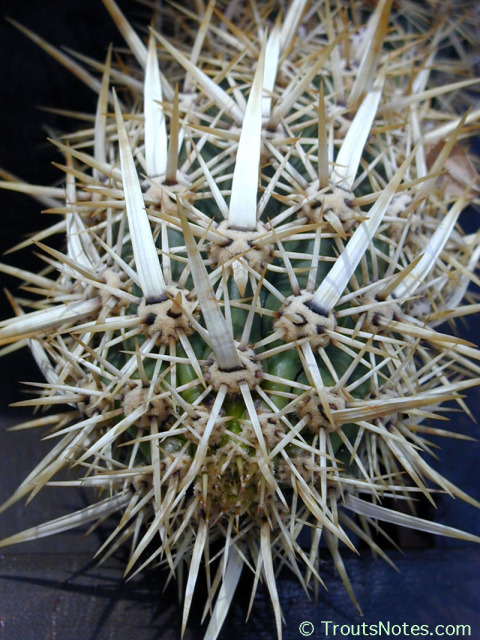 Pachycereae): 99, as Stenocereus beneckei. Hertrichocereus beneckei in Backeberg (1951) Cact. Succ. J. (USA), 23: 120. Lemaireocereus beneckei in Britton & Rose (1923) Cactaceae, 4: 273, fig. 247. Rathbunia beneckei in P.V. Heath (1992) Calyx, 2 (3): 103. Etymology: Specific name beneckei was named for the German consolate in Mexico, Stephan (Etienne) Benecke. Occasional in occurrence between Coxcatlan (Puebla) and Teotitlan (Oaxaca): Jorge Meyrán García 1973. Stacheln 1–9, unregelmässig, stark, steif, nagelförmig, ungleich, braun, schwarzbraun, an der Spitze schwarz, 1 Lin. – 2 Z. lang.” column 835 in Ehrenberg 1844. Plant is bright green but may be reddened, around 1.5 meters tall, may be erect or prostrate with sprawling branches that have 7 to 9 ribs. The areoles are set around 2.5 to 4 cm apart. 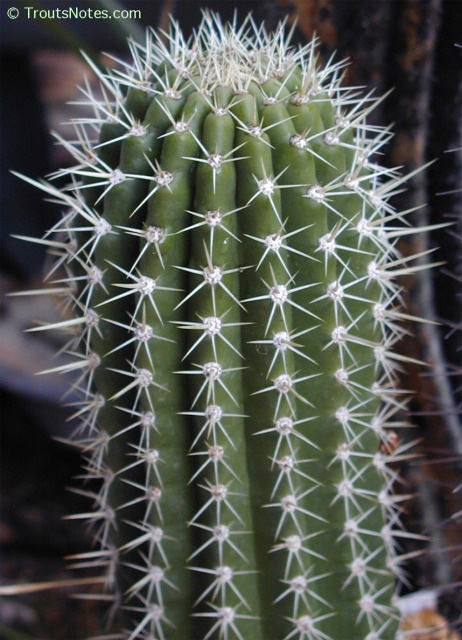 5 radial spines are around 1.5 cm long; one central spine up to 5 cm long. Sometimes the spines have fallen off. Flowers are 7.5 cm long and 6 cm in diameter. Red colored fruit is 5 cm long and 3 cm in diameter. Backeberg 1960 4: 2235. 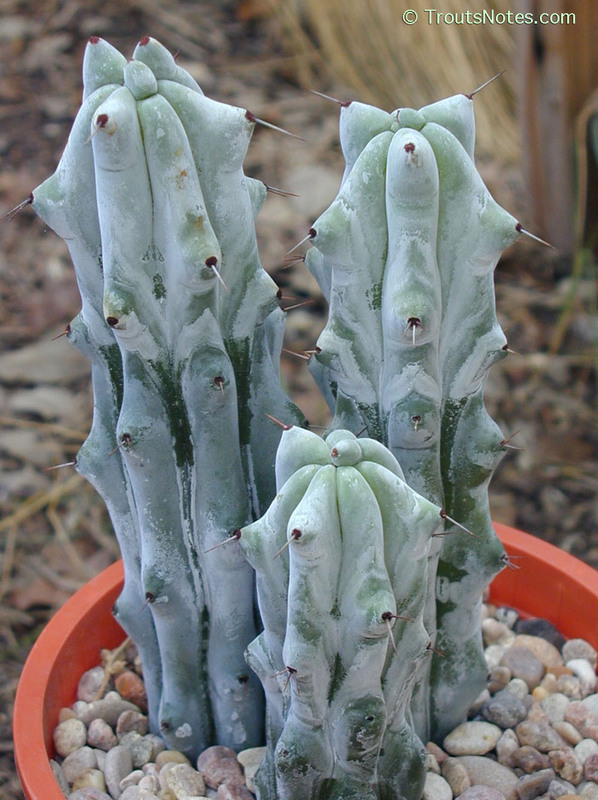 (as Hertrichocereus pp. 2232-2235.) and García 1973. Photograph of entire plant p. 2233, fig. 2131. Plant with flower page 2233, fig. 2132, plant with flower buds fig. 2133, page 2234 in Backeberg 1960 vol. 4. Also see: Danny Schuster 1990; color photograph with side view of a flower on page 135. 3,4-Dimethoxyphenethylamine was indicated by tlc as less than 0.01% while ms-ms estimate was 0.01%. Townshend Stith Brandegee (1889) Proceedings of the California Academy of Sciences, ser. 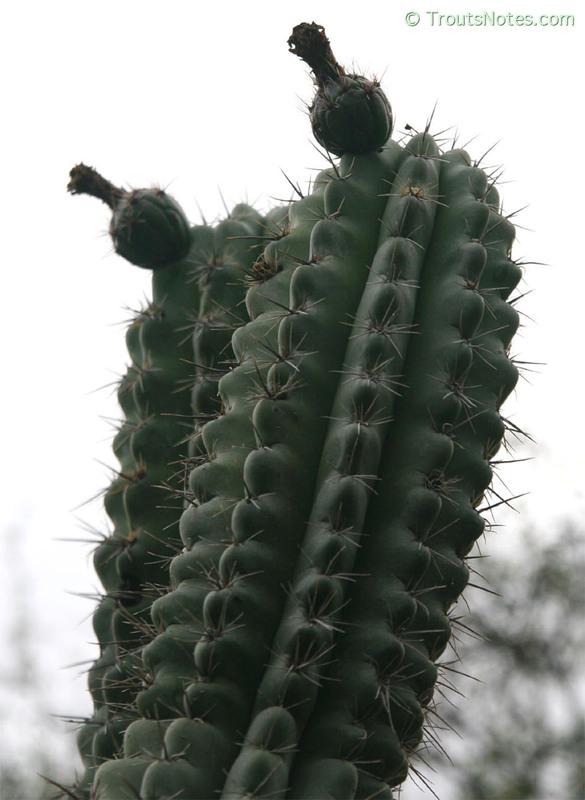 2, 2: 163, t. 7, as Cereus eruca. 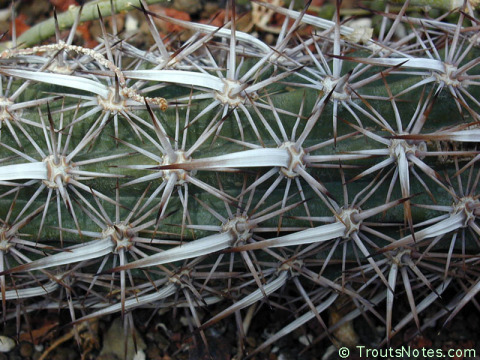 Arthur Charles Gibson & Karl E. Horak (1979) Annals of the Missouri Botanical Gardens, 65: 1007, as Stenocereus eruca. Best known as Machaerocereus eruca, which was published in Nathaniel Lord Britton & Joseph Nelson Rose (1920) Cactaceae, 2: 115, fig. 171, 172. Lemaireocereus eruca in N.L. Britton & J.N. Rose (1909) Contributions from the U.S. National Herbarium, 12: 425. Rathbunia eruca in P.V. Heath (1992) Calyx, 2(3): 102. 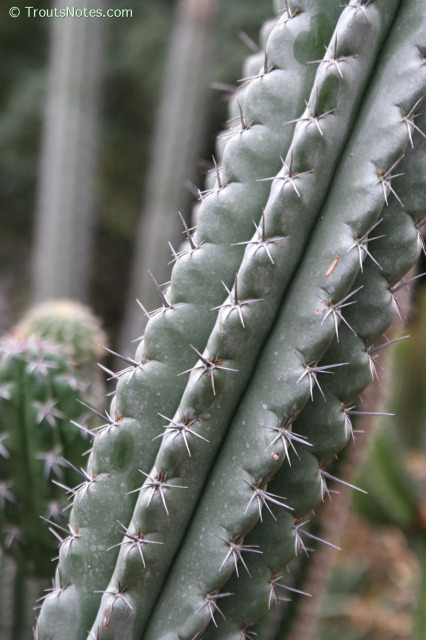 Etymology: Machaerocereus was from macaera “dagger”, hence one common name ‘Dagger Cactus’, in reference to the shape of the spines; eruca is similarly from the Greek meaning “caterpillar” in reference to its creeping habit. 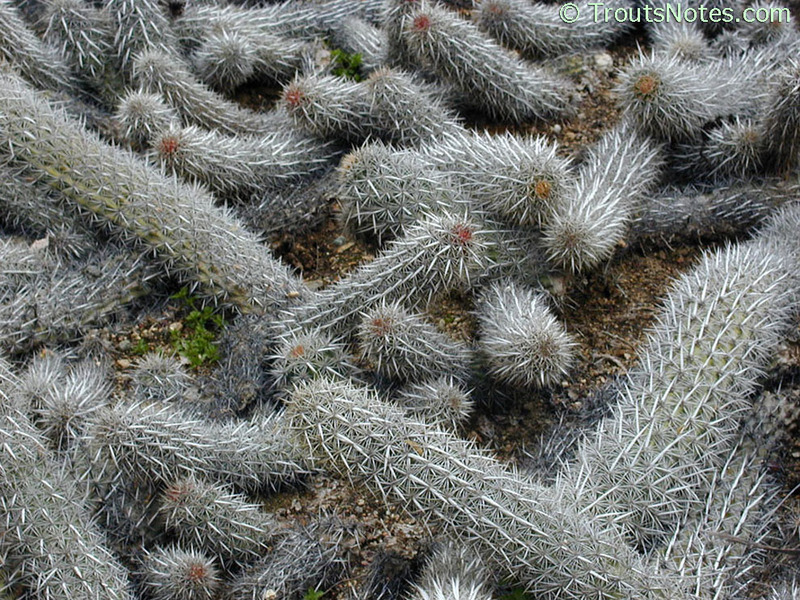 It is easy to see why some people would call this the “dagger” cactus. “Prostrate, very rarely branched, 13-ribbed, 3-4 feet long, 3-4 inches in diameter; rooting from the under side of the older growth, decaying at one end and growing forward at the other, generally in patches of 20-30, probably originating from a common center: areolae 4-6 mm. 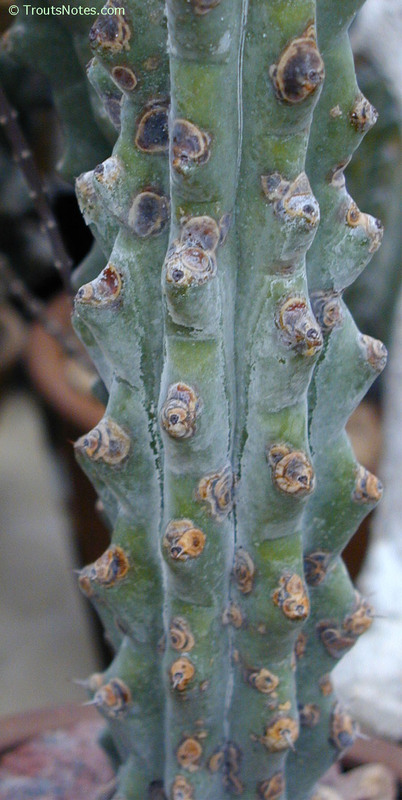 in diameter, separated about the same distance: spines about 20, stout, ash-colored, less than an inch long, the exterior cylindrical, the interior stouter, angular, somewhat and the lower central one much flattened, more than an inch long, angular, strongly reflexed: flowers and fruit not seen. 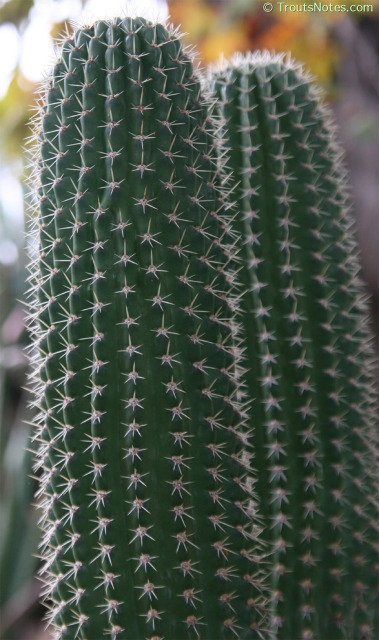 […] The manner of growth, with uplifted heads and prominent reflexed spines, gives the plants a resemblance to huge caterpillars. The flowers are said to be yellow.” p. 163 in Brandegee 1889. Plants grow prostrate with the growing tip slightly elevated. Many times the decaying base of the plant with new roots forming under the plant give the impression that they are slowly crawling away from their point of origin leaving a trail of debris (hence its most common name). Stems are usually 1 to 3 meters in length and 4 to 8 cm in diameter. There are usually around 12 ribs with large areoles set about 2 cm apart. They are fiercely spined (unequal and pale grey or white) with around 20 spines per areole. Yellow flowers [cream colored; sometimes with pink base] are 10 to 14 cm [4-5 in.] 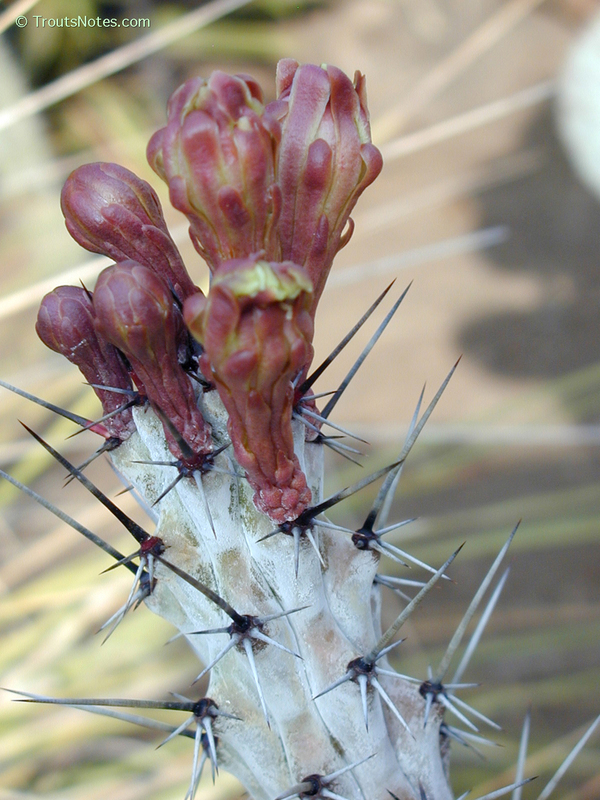 long and 4-6 cm wide; forming a 4 cm long, spiny, scarlet fruit. Spines fall off when ripe. Backeberg 1960 4: 2114-2115, pictures pages 2114, fig. 1996 and 2115, fig. 1997, and Britton & Rose 1920 2: 115-116, pictures, fig. 171 on page 115 (in habitat) and fig. 172, page 116. and Pizzetti 1985: entry #156 (has photo of young plant). 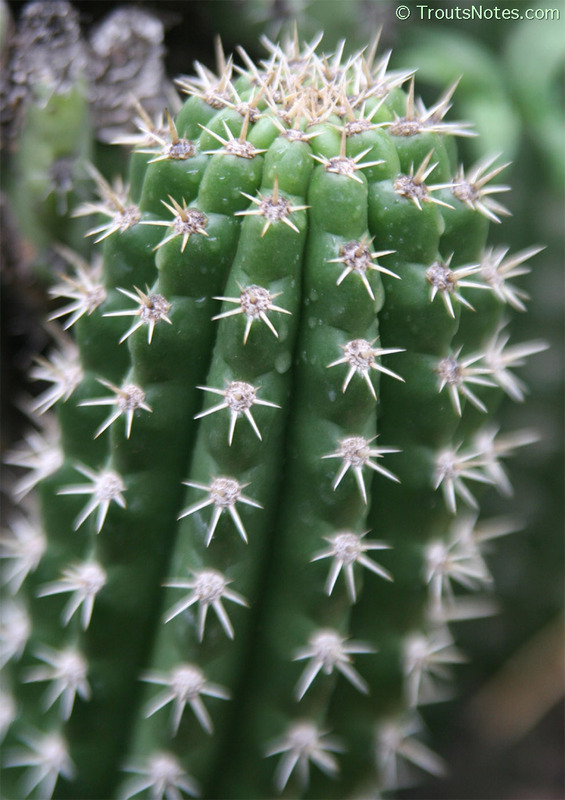 Mescaline was indicated to be present at less than 0.01% (dry weight) by tlc but was not observed using tandem mass spectrometry. 3,4-Dimethoxyphenethylamine was indicated to be present at less than 0.01% (dry weight) by tlc but was not observed using tandem mass spectrometry. 3,5-Dimethoxy-4-hydroxyphenethylamine was indicated to be present at 0.01% (dry weight) by tlc but was not observed using tandem mass spectrometry. The triterpenes, Lupeol and Lupenone, were isolated by Kinoshita et al. 1992. Djerassi et al. 1953a had earlier identified Queretaroic acid and Oleanolic acid. 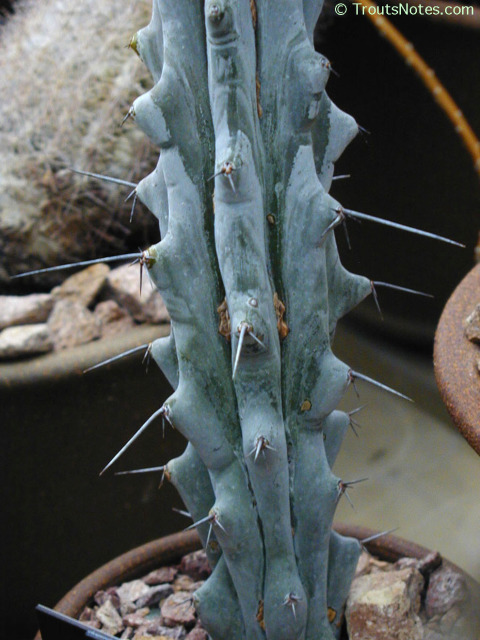 W. Taylor Marshall & Thor Methron Bock 1977 noted that this cactus, although popular, is very prone to rotting and rarely flowers in cultivation. They recommend that the soil be well draining but not too rich and that due to its slowness in rooting, water should be withheld at first and then given only lightly. 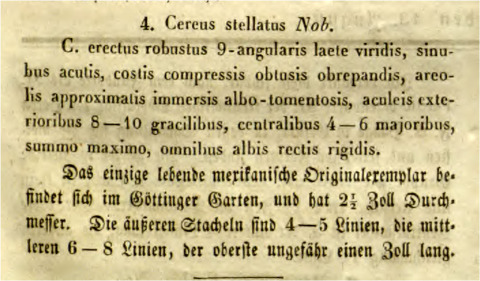 Louis Karl Georg Pfeiffer (1836) Allgemeine Gartenzeitung, 4: 258, as Cereus stellatus. 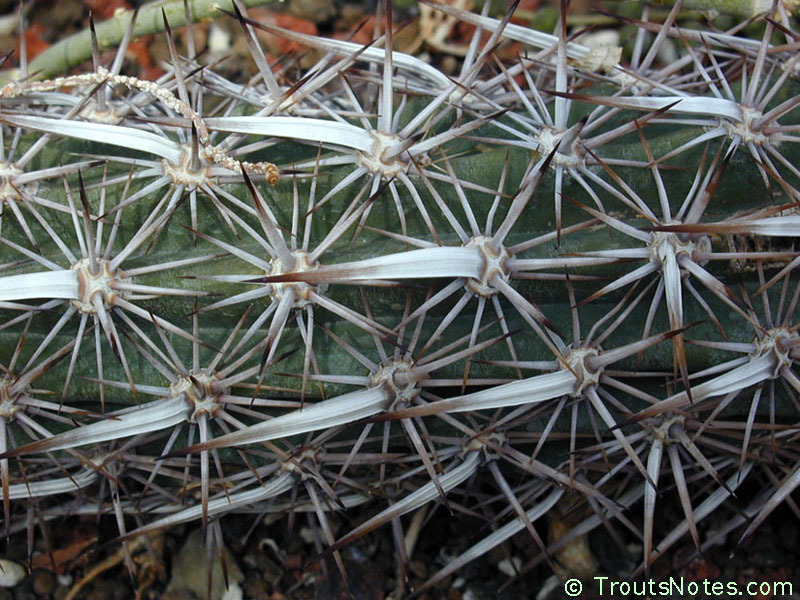 Vincenzo Riccobono (1909) Bollettino delle R[eale] Orto Botanico di Palermo, 8: 253, as Stenocereus stellatus. Lemaireocereus stellatus in Britton & Rose (1909) Contributions from the U.S. National Herbarium, 12: 426, pl. 69. Neolemaireocereus stellatus in Backeberg (1942) Jahrbuch der Deutschen Kakteen-Gesellschaft in der Deutschen Gesellschaft für Gartenkultur, 1941, pt. 2: 46. Water content: 87.4% water by weight. Fruit is called “Joconoxtle” Helia Bravo 1931. Britton & Rose 1920 also noted the fruit to be known by that same name in local markets and occasionally as “tuna”. 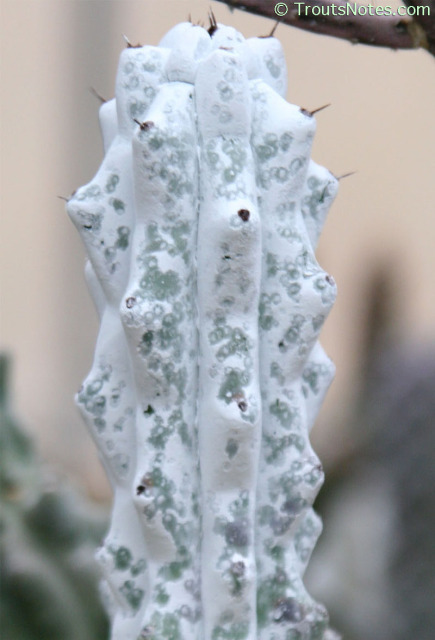 Etymology: “stellatus” is in reference to the starry or “stellar” appearance of the spine clusters. The adults can be stunning. Erect columns to 3 meters tall. Matte, dark green often reddish (Backeberg). [Pale bluish green (Britton & Rose).] Branching mainly from the base. Branches can be up to 8 cm in diameter. The 8 to 12 ribs may show tubercles but are low and obtuse. It bears white flowers at or near the apex, which are pink on the outside (red according to Britton & Rose) and up to 6 cm long (4 in Britton & Rose) The deciduously spiny spherical fruit is 3 cm in diameter, red and edible. Britton & Rose 1920 2: 92-93. See also Backeberg 1960 4: 2223, pictures on page 2220, fig. 2116 and on 2221, fig. 2117. Also fig. 17 in García 1973 and fig. 136, page 94 in Britton & Rose for a picture in habitat. Also see Bravo 1931: page 123, fig. 8 for a picture of a plant with fruit. 3,5-Dimethoxy-4-hydroxy-phenethylamine present in similar amounts. Djerassi et al. 1955 found 3.5% triterpenes (reporting both oleanic acid and the triterpene lactone stellatogenin) but reported no alkaloids from this species. 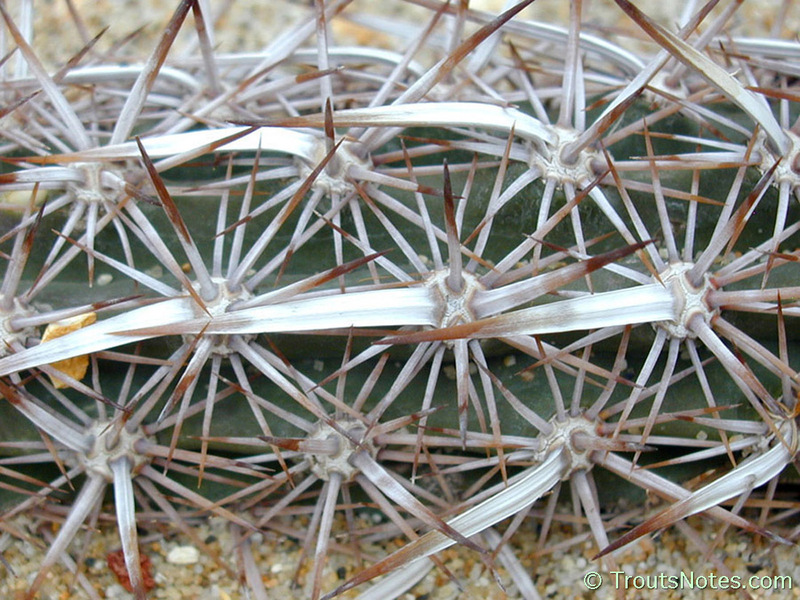 See comments on Djerassi under Stenocereus eruca. Joseph Nelson Rose (1909) Contributions from the U.S. National Herbarium, 12: 426, tab. 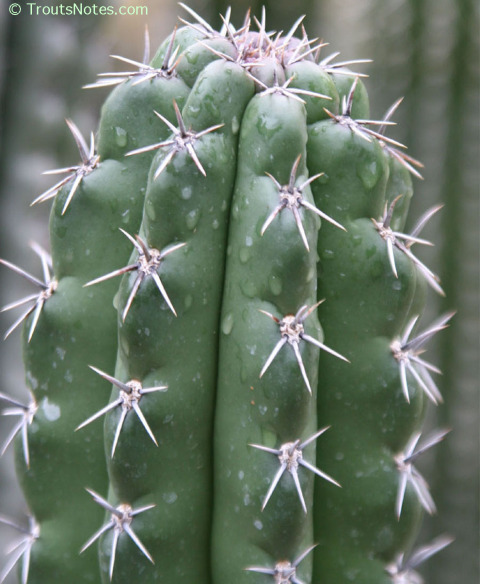 70 as Lemaireocereus treleasei. 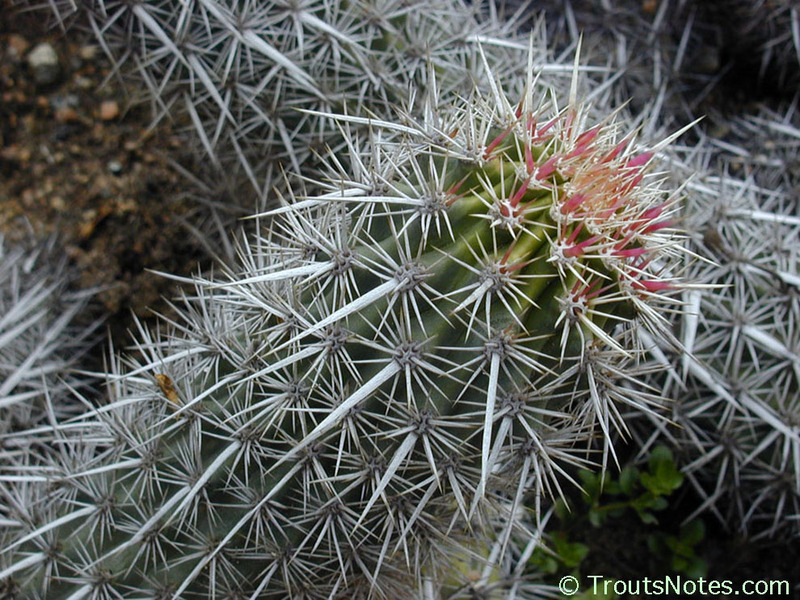 Curt Backeberg (1951) Cactus & Succulent Journal (USA), 23: 120, as Stenocereus treleasei. Cereus treleasei in Vaupel (1913) Monatsschrifte fuer Kakteenkunde, 23: 37, 58. Water content: 82.6% water by weight. Common name: “Tunillo” Djerassi et al. 1956; also Bravo 1931. Etymology: “treleasei” was for the botanist William Trelease. Distribution & occurrence: Oaxaca, Mexico (Road between Mitla and Oaxaca). Usually simple columns to 7 meters tall. Rarely branching from the flank. There are up to 20 tubercled ribs with a v-shaped depression. Spines are short and yellowish, borne in groups of 7 to 9. Later one grows longer and appears more distinctly central. Diurnal flowers resemble S. stellatus but are up to 5 cm. in length. Fruit is red and covered with deciduous spines. Britton & Rose 1920 2: 93-94. 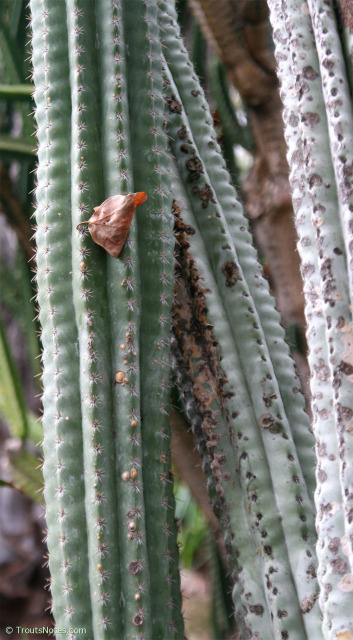 Britton & Rose noted that the plant is not common in the deserts around Oaxaca but does occur in clumps. 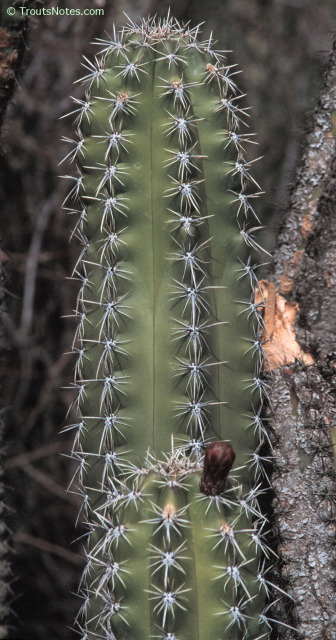 They mention that while its flowers and fruit resemble those of Lemaireocereus stellatus it has a different habit, more ribs and different areoles. They characterize it by having seldom branching, strict, elongated stems. See also Backeberg 1960 4: 2223, picture on page 2222, fig. 2120. Ma’s specimen was unvouchered and may actually have been a form of S. stellatus. Djerassi et al. 1956 found oleanic acid and the triterpene lactone stellatogenin but reported that no alkaloids were present. See comment on Djerassi below. During their studies elucidating the terpenoids present in a number of plants, Carl Djerassi and coworkers published a series of papers in which they reported finding no alkaloids in numerous species that were later determined by other workers to contain alkaloids. Djerassi’s alkaloid detection procedure usually consisted of extracting with alcohol, evaporating to a residue and extracting the residue with ether. They assumed any alkaloid present would be extracted into the ether and show alkaline results. 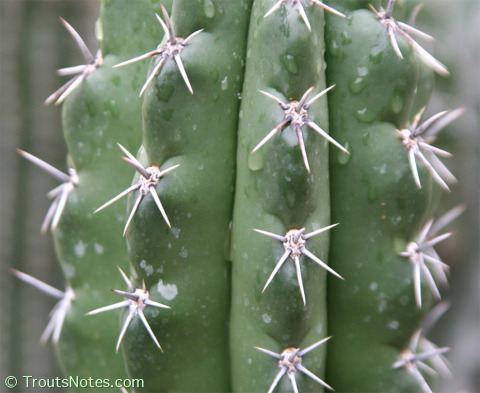 Many alkaloids, including mescaline, are not particularly soluble in ether. Others are neutral rather than alkaline. 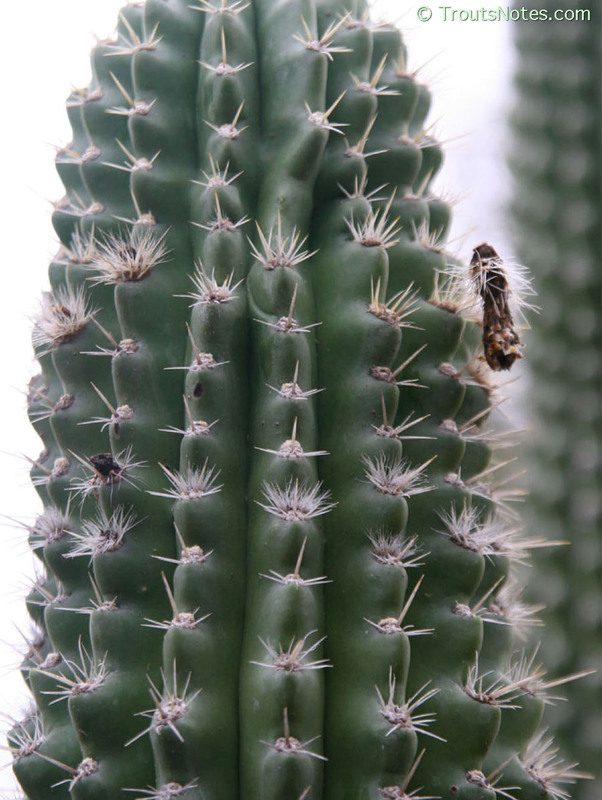 If one examines their results, it rapidly becomes unsurprisingly apparent what the few alkaloids they did report from cacti were all ether soluble (such as anhalonidine reported from Lemaireocereus (Pachycereus) weberi in Djerassi et al. 1954). 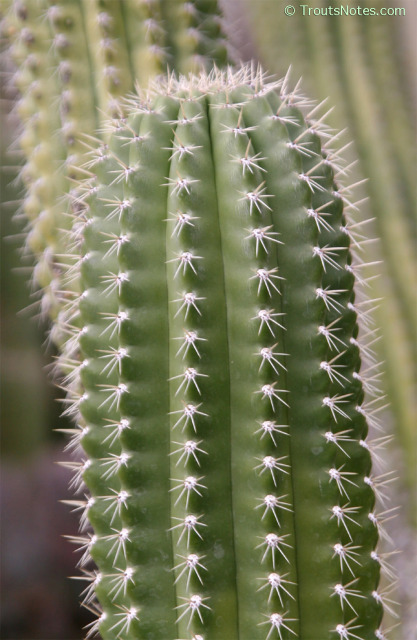 Many cacti which they assayed as negative (such as several of the numerous Lemaireocereus spp. they looked at) were subsequently shown to contain only trace amounts of alkaloids by later workers but others (such as Trichocereus peruvianus) proved to be a good source of alkaloids. Djerassi and coworker’s papers should be noted by chemotaxonomists. Both alkaloids and compounds such as triterpenes and lactones are valuable qualitative marker compounds for chemotaxonomic work in spite of their quantitative variability. Unusual amino acids observed in seeds and flavones are good and proven markers. Biominerals also appear to have diagnostic usefulness. Chemotaxonomy is best viewed as a supplemental tool and cannot replace the existing taxonomic system on its own. While alkaloid and triterpenes present reflect what enzymes are expressed and hence mirror elements of genetic structure, not all genes are necessarily expressed. This is an important point in understanding the sometimes conflicting array of plant products formed by closely related plants. Anyone with an interest in chemotaxonomic approaches is urged to obtain a current and solid understanding of and familiarity with what is presently known in immunology concerning variability of gene expression, (regardless of their qualifications and background). What has been elucidated concerning the origin of the variability and diversity of antigen receptor sites (in humans) is most applicable towards enlightenment in this area. Chemotaxonomy might be welcomed and understood rather than resisted and belittled for its limitations.